Sauteed with “Southern Comfort” barbecue sauce served over creamy grits, topped with cheddar cheese, bacon, & green onions. 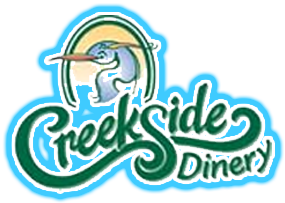 Seasoned with Creekside’s spicy datil pepper blend & seared in a hot iron skillet. Seasoned with Creekside’s spicy datil pepper blend then seared in a hot iron skillet. With “Southern Comfort” barbecue sauce served over creamy grits, topped with cheddar cheese, bacon, & green onions.